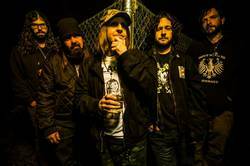 There's news on the Eyehategod front, as guitarist Brian Patton has decided to leave the band. Touring and being away from my family started to get harder after my daughter was born. Then soon after the arrival of my son, I left for a six-week tour. While I was away, both kids had some serious health scares. Being away from my family while that happened, along with an increasingly busy tour schedule, I decided the best thing for me was to step down. To concrete this decision, after a visit with my wife's parents earlier this year, it became clear that my in-laws' health was rapidly fading and they needed our help. So my family and I have moved to Greensboro, North Carolina to care for them full time. Trust me when I say that this has been one of the hardest decisions I've ever had to make. After being in this band for twenty-five years -- over half of my life -- to say that I will miss it is a huge understatement. I already miss it. Ultimately, I want to be at home with my family. But more importantly, I am truly needed at home. I love my brothers in EYEHATEGOD, of course, and wish them nothing but the best. Thank you to everyone who has supported me and the music I have played throughout the years. I hope to see you all soon. I plan on playing again in some form or fashion. But for now, my family comes first. The band will keep active following the departure, with a North American your with Black Label Society and Corrosion of Conformity underway. The band is celebrating their thirtieth anniversary this year.